Do you want to play the DVD background music on your music players, like MP3 player, MP4 players, cell phone, iPad, iPod, iPhone, etc? Maybe you are suggested to rip DVD audio to MP3 using VLC media player, but the truth is that the whole operating procedure is much more complicated than it seems. Eager to try on an easier solution? This article introduces a professional yet free DVD audio ripper for Mac to help you sweat-free rip audio from DVD freely, so that you can enjoy the DVD background music on your gadget wherever you go. MacX DVD Ripper Mac Free Edition is an outstanding tool which can rip audio tracks from new DVD movies and rip DVD audio to MP3 files for playback. With this Mac DVD audio free ripper, you will find it is so easy to rip sound from DVD. The following paragraphs would show you how to extract audio from DVD and rip DVD audio to MP3 files step by step. Step 1. Add DVD Movie. Free download this free audio from DVD ripper Mac and run it. Then, just insert your favorite DVD on the DVD-ROM and load your DVD through "DVD Disc" button. Alternatively, you can hit "DVD Path" to import DVD files. Step 2. Select MP3 Music as Output Format. In the output format area, select the target format "to Music". There are also much more output video format to be chosen, such as DVD to AAC, DVD to AC3, MP4, iTunes, MOV, FLV etc. Step 3. Set Output Folder. Step 4. Rip DVD Audio to MP3 on Mac. When the settings are done, click the "RUN" button to start ripping DVD audio or ripping music from DVD disc. And then the free DVD ripper for Mac will automatically start to extract audio from DVD to MP3 on Mac. This Mac DVD ripper is not only a DVD to MP3 music freeware, but also a professional DVD to Video Converter. It can convert DVD to all popular video formats, such as convert DVD to MP4, DVD to MOV, iTunes, etc. Seeking for another Mac DVD ripper software which supports much more output video, you can check its advanced version MacX DVD Ripper Pro to help you rip any DVD to iPhone, iPod, iPad, Apple TV and PSP etc. MacX DVD Ripper Pro, the best DVD to audio ripper is designed to rip DVD to MP3, AAC, AC3 for Mac (El Capitan, macOS Sierra included) fast with no quality loss, regardless of the DVD copy protections such as DVD CSS, region code, RCE, Sony ArccOS, UOPs, Disney X-project protection, etc. As an addition, here we also recommend you to have a try on another DVD audio ripper open source - DVD Audio Extractor, which is a widely famous tool to free extract audio from DVD disc, Blu Ray disc, DVD-Audio disc and save them as MP3, OGG, Wave or FLAC file formats. Now, it works seamlessly with Mac OS X 10.9 Mavericks. For Yosemite, El Capitan and macOS Sierra users, it's still advisable to rip audio from DVD on Mac with the first DVD converter freeware. After you ripped DVD to MP3, AAC etc. with the free DVD audio ripper for Mac, you are suggested to move music to iPhone iPad for listening on the go. MacX MediaTrans, an alternative to iTunes, helps you transfer music from Mac to iPhone easily without any bothering of iTunes. It's also featured with managing music files on iPhone, such as editing music detail info, deleting songs in batch, making ringtone etc. Want to rip and convert DVD audio to MP3 for playback on your portable devices? 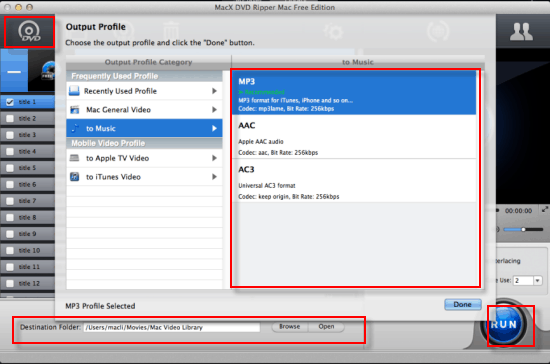 This guide will show you how to free extract DVD music to MP3, AAC, AC3 on Mac by using the best free DVD audio ripper for Mac (10.11). The best DVD to MP3 converters for Mac and Win are reviewed. Here you can free download top DVD to MP3 ripper full version and extract MP3 audio music from protected/homemade DVD video with highest quality yet fastest speed. MacX DVD Ripper Pro is one of the best tools which help you to extract DVD audio on Mac for freely replaying on the move. It's also very useful when you're trying to back up your DVD collection.